A new wonderful project for the international speculative fiction is being born from the initiative of Jason Erik Lundberg and Math Paper Press, also responsibles for “Fish Eats Lion: New Singaporean Speculative Fiction”. 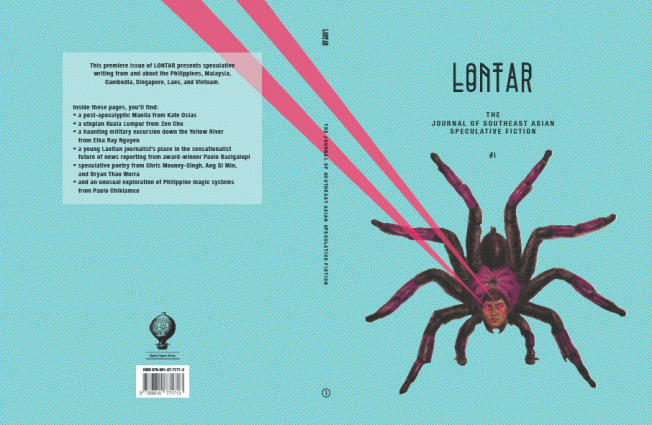 LONTAR is a new magazine in English, a literary journal of Southeast Asian speculative fiction. But let’s better leave LONTAR present itself. “Lontar” is the Bahasa Indonesia word for a bound palm-leaf manuscript. Palm-leaf manuscripts are among the oldest forms of written media, dating as far back as the fifth century BCE and possibly earlier. They were used to record Buddhist sutras, law texts, epic mythic narratives, and treatises on a host of subjects such as astronomy, astrology, architecture, law, medicine, and music. The palm leaves were bleached of their chlorophyll, dried, trimmed, flattened, and polished smooth. Characters or images were scratched on the surface with a sharp metallic stylus and filled in with a dark pigment to enhance the contrast and legibility of the script. In order to construct the leaves into a book, holes were drilled in both sides, and the stack was bound together with cord or string. This ancient form of writing is the perfect inspiration for the collation and curation of Southeast Asian speculative fiction. It is an early technology that revolutionized the dissemination of knowledge (it no longer had to be handed down exclusively in oral form), and it was used predominantly in India, Thailand, Cambodia, Laos, and Indonesia. In addition, lontar were used as a vehicle for both epic and more mundane narratives, as well as an early form of graphic literature (classifications for the different types of lontar can be found at Wonderful Bali). It is true that Western writers such as Paolo Bacigalupi and Geoff Ryman have shone a speculative light on SEA countries such as Thailand (The Windup Girl) and Cambodia (The King’s Last Song), but we can go even further to promote the genre and the region. LONTAR is engaged with publishing speculative fiction, non-fiction articles, poetry, and sequential art from both SEA and non-SEA writers, in order to spread awareness of this literature to readers who might not normally be exposed to it, and to celebrate its existence and diversity within the region. The first issue is being prepared to be published later in August and it already promises plenty of excellent things. I wish LONTAR the best of luck and I hope to see it enchanting us for many years and issues to come.